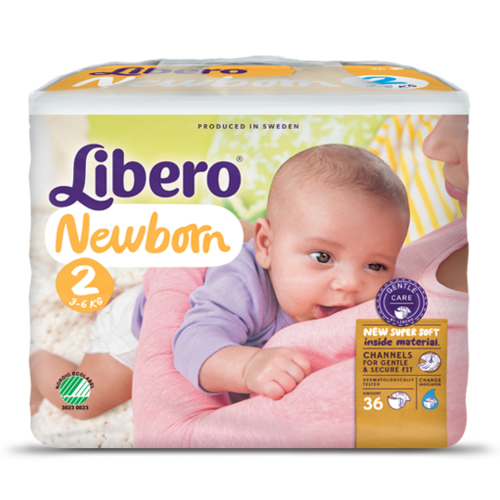 Made for newborn babies 3-6 kg. 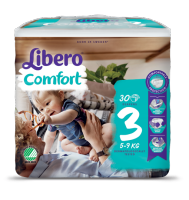 Extra soft surface material and pliable fit and leakage barriers and waist elastic to prevent anything from leaking onto the baby's stomach and back. Specially shaped to release pressure from the delicate belly button of new born babies. Ideal for babies lying down on the back but also when they are starting to roll. The change indicator transforms from yellow to blue when it’s time to change the nappy. This helps to keep the baby's skin soft and dry. 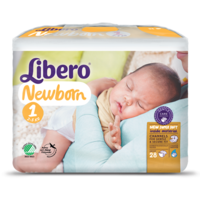 Libero nappies have hook-fastening tabs that are secured to the front of the nappy, which can be opened and closed as many times as necessary to achieve the perfect fit. Whether your baby is sitting or standing, the elastic waistband and the hook-fastening adapt to fit your baby’s movements. The yellow stripe change indicator on the outer surface, changes colour when the nappy is wet. It supports in knowing when it’s time to change nappy. This helps to keep the baby's skin soft and dry. The nappy is designed to leave some space in the waist area to give room and release pressure from the delicate belly button.